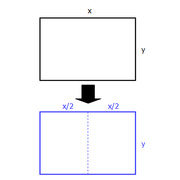 A project requires a rectangular sheet of cardboard satisfying the following requirement: When the sheet is cut into identical rectangular halves, each of the resulting rectangles has the same ratio of length to width as the original sheet. Which of the following sheets comes closest to satisfying the requirement? So, when you half a rectangle, one side will get halved and other will remain the same. Thus the ratio of B:L should be same as L/2:B or L:2B.. This means B:L=L:2B or \(L^2=2B^2\)..
Let us check the options with this. We want the resulting rectangles to have the same ratio of length to width as the original sheet. (A) 10/7 = 1 3/7 ≈ 1.4 LOOKS GOOD!